Online ordering menu for MIA'S PIZZERIA. 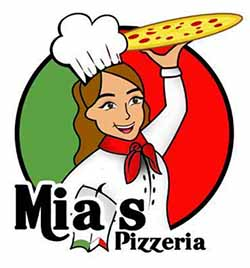 Here at Mia's Pizzeria, we're a family-owned pizza place that values taste, integrity, and good customer service! You can build your own pizza or try one of our signatures such as the Asian Delight, Chicken Vodka, and Mamma Mia! We also serve pastas, wings, and salads. You can't leave our restaurant without trying our Cheese Rolls, Garlic Bread, or the Garlic Cheese Bread! Find us south of I-4 on Vineland Ave. We're located near the Premium Outlets and we're not too far from Disney World! Order online for carryout or delivery!